Years ago I became intrigued by the idea that some forms of perception involve physical mimicry. One of my college linguistics classes (back in the mid-90s) touched on the motor theory of speech perception, which asserts that when we listen to speech, we reverse-engineer the sounds we hear, identifying each sound with the motion or “gesture” of the vocal tract that would be needed to produce it. So, when I listen to you say a word like “dog,” I recognize the word by preparing to say it myself, or at least by figuring out what I’d need to do to with my mouth in order to make those same sounds. In fact, some studies show that seeing and hearing speech excites the motor system involved in speech production (to quote the title of one paper by Watkins, Strafella, and Paus) — when I listen to you say “dog,” I exhibit neural activity similar to the act of speaking. 1) Stick your tongue out as far as you can (as when a doctor asks you to say “ahhh”) and keep it in that position. 2) Now try to imagine yourself saying the word “emperor.” Try to hear the word in your mind’s ear (as when you talk silently to yourself) but don’t actually say it out loud or do anything with your mouth besides holding your tongue out. Although your tongue should remain extended as you do this, you should try to imagine the word pronounced clearly, as you would normally say it (i.e. without an extended tongue). Stop reading and try it! Were you able to hear the word “emperor” enunciated without a lisp in your mind’s ear? Or did you find that were only able to hear something like em-pah-wah — the way “emperor” would sound if actually spoken with an extended tongue? I’ve administered this experiment to countless “subjects” informally over the years, including dozens of unsuspecting conversation partners at coffee shops throughout New England, and approximately 30 classmates in an Artificial Intelligence class I took as a grad student. I find that roughly half of participants react to me as though I’m crazy, not because I’m asking them to do something silly like sticking out their tongue, but because they have no problem imagining a clearly pronounced “emperor” in step 2 and therefore don’t see any point to the experiment. The other half quickly bursts out laughing in step 2, because they discover (often to their great surprise) that they simply cannot imagine a clearly pronounced “emperor” while they keep their tongues extended — they can only imagine a mangled, lisping em-pah-wah. Their imagination is a slave to their tongue! My own experience was that I could only hear em-pah-wah the first couple of times I tried the experiment, but with some practice, I gained the ability to imagine a clear “emperor” no matter the position of my tongue. So it seems that a physical obstruction interferes with imagined speech for some subjects initially, but it’s possible to learn to separate the imagined sound from what it suggested by the obstruction. I still wonder why people have such different experiences the first time they try this expirement: why is it initially easy for some but hard for others? And how might other kinds of physical or motor interference affect what we can perceive or imagine? I haven’t had occasion to study “extended tongue effect” formally, and I don’t know whether something similar to the emperor experiment occurs in the research literature: I’d appreciate any references you might send my way. It’s not easy making signs (as evidenced by the preponderance of wretched signage in our world), and so I can easily imagine an incautious sign-maker trying to write PLEASE and having it come out as PLOWS. All prose is wordy–it’s made of words! 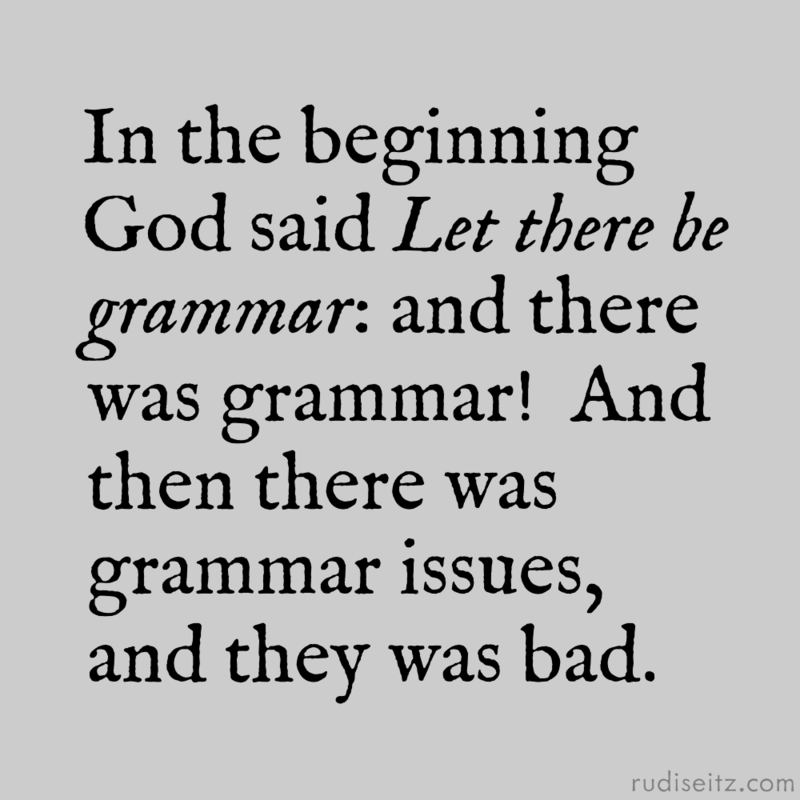 So when does prose, a fundamentally wordy thing, deserve to be disparaged as wordy? I struggle with this question because my brain is wordy–got lots o’ words. My thoughts are wordy, so my writing comes out wordy. How much time should I spend eliminating “unnecessary” words? The question is complicated because “wordiness” is a matter of perspective. If someone is convinced I’m a good writer, or if they’re particularly interested in my subject, they will likely ignore the redundancies in my prose. However, if they don’t “trust” me as a writer, or if they are bored by my topic, they will notice and object to my excesses. We accept the wordiness of great speeches like Lincoln’s Gettysburg Address because all of the verbiage becomes a substrate for the aura–and the sound–of a great speaker. Read it like Lincoln, and it does sound great; read it in the voice of a bored student, not so much. Our nation was founded eighty-seven years ago on the idea that all men are created equal. Our civil war is now testing whether any nation based on that idea can endure. Today, we dedicate a portion of the battleground to our fallen troops. But in a larger sense, we cannot hallow this ground with words–the troops have already hallowed it with their struggle. Instead of talking idly, we should dedicate ourselves to their unfinished work, so they will not have died in vain. Let’s keep our nation free and ensure that self-government survives on earth. I created this sign to remind everyone that swearing is prohibited on the Internet. Actually, I created it as an experiment in communicating with visual and textual symbols. There are three elements at play here: a red circle, the words “SWEARING PROHIBITED,” and a grawlix (“$@&#!”). When you put those elements together, what message do they make? For me, the sign is hard to look at without laughing because I find it fundamentally hypocritical: it swears! Now for me, “$@&#!” is so strongly associated with swearing that when I view it in this sign, I become witness to a curse. And then I begin to wonder who’s cursing, and how the curse might relate to the rest of the sign. Is someone cursing because they don’t like the prohibition against swearing? Or do they really, really agree with it? Even if you don’t experience the grawlix as an actual curse, you might notice a mismatch between levels of formality in this sign. 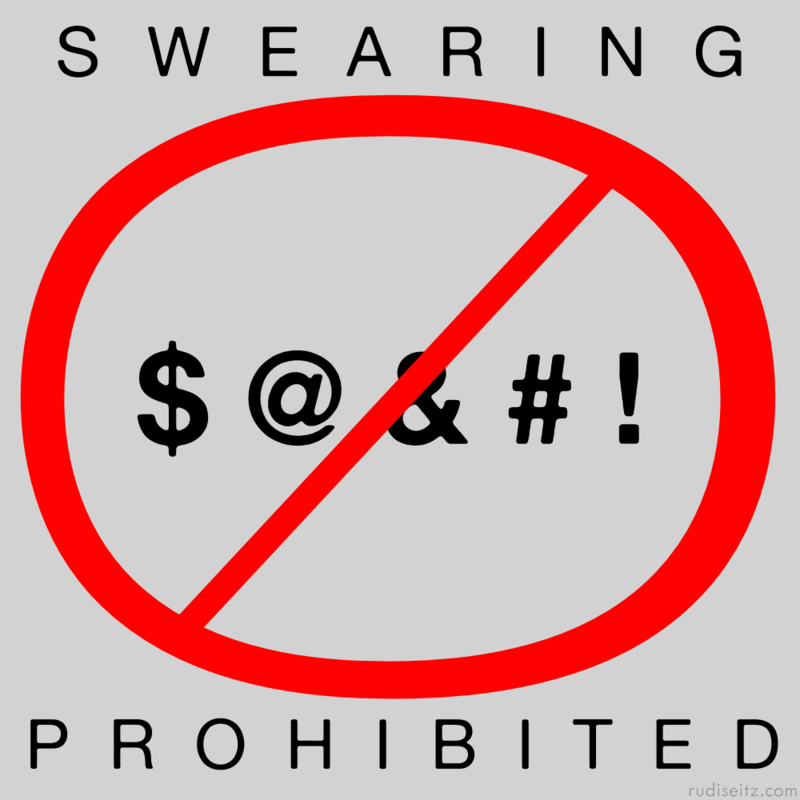 SWEARING PROHIBITED sets a tone of severe formality, and yet “$@&#!” is the kind of icon we might see in a comic book. The sign has the same contradiction as a statement like: DO NOT SPEAK COLLOQUIALLY OK? As I worked on the sign, I couldn’t resist the temptation to make an intensified version, which you’ll see below. For a while I thought that what I had come up with was so contradictory that no viewer could take it seriously. And yet, as I stared at this second version, my perceptions shifted. Where it had seemed that the swear words were subverting the circle by shining right through its porous front, now it seemed that those bold and brazen words were still captured inside the circle and still negated by it. Who wins, the circle or the swears? I don’t know: either it’s the most obscene sign I have ever seen, or the most uptight one.